Special Order Packages - Continuous Air Systems Inc. Continuous Air Systems is capable to custom build complete compressed air packages to suit our customer's specific needs. 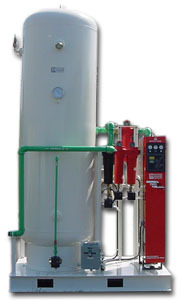 Packages can include a compressor, air dryer, wet and/or dry air receivers, air filtration and condensate management. Complete piping, electrical and instrumentation are also provided. All components can be skid mounted ready for installation. This means only two on site connection requirements. One to tie in your electrical supply, and the other to connect to your existing compressed air piping. To learn more about Continuous Air Systems piping installation click here. Supply us with your desired specifications such as maximum package dimensions, operating pressure, required CFM air delivery, minimum dewpoint, and filtration requirements and we will design and build your new "drop in" compressed air solution. What if you require a compressor with a size restriction so unusual that no available OEM compressor fits the bill? Continuous Air Systems can strip down and redesign a compressor to match the dimensions you supply. Rebuilt packages can be trailer mounted for portability or, if height is an issue, skid mounted with heavy duty guards included to avoid accidental damage to critical components. Tell us what you need in a custom compressor arrangement and Continuous Air Systems can build it.